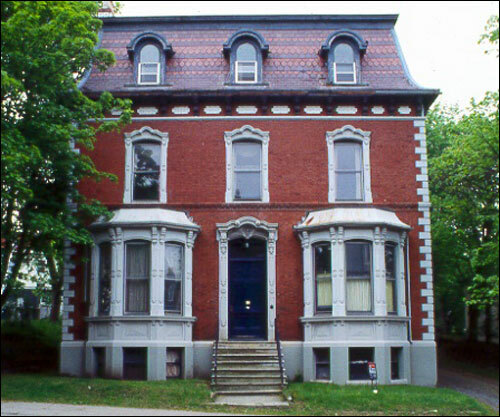 This superb brick example of the Second Empire style at 49 Rennies Mill Road, St. John's, was built in 1885 by John Score for Alexander Marshall, a St. John's merchant. Unquestionably the most elaborate and most modern house in the city at the time, it cost $20,000 to build. The Evening Telegram described it as "a magnificent residence... a monument to success in business, and an ornament to the neighbourhood, and a most convincing proof of the mechanical skill of our native workmen." It is one of the few houses that survived the Great Fire of 1892. With the elaborate detailing of the window surrounds, the patterned roof slate, the modern hot-water radiation heating system (which served both the house and the glass conservatory) and the mahogany window sashes fitted with plate glass, the house clearly deserved the newspaper's praise. The conservatory was built by the firm of Lord and Burnham, and is the only one of its kind remaining in Newfoundland. A similar Lord and Burnham conservatory at Government House was taken down several years ago. The conservatory is constructed of iron and glass and is divided into two sections. The first forms an entranceway from the house, while the second section is the largest part of the conservatory, and features its own fireplace. In 1885 the ground floor was divided into a dining room, parlour and lavatory, all with twelve foot ceilings and cherry wood mouldings. The front porch was designed with leaded glass sidelights and doors and decorative tin walls and ceiling. The first floor was designed with three bedrooms, the attic with six. There are ten working fireplaces throughout the house. Alexander Marshall was a dry goods merchant who had been in partnership with the Ayres, and who later formed the firm of Marshall and Rodger. The Water Street building in which they conducted their business, the Marshall Building, was also built of red brick and featured pressed brick friezes. It was designed by W.H Greene, whose business partner, John A. Pearson of Toronto, is said to have married Marshall's daughter Agnes in 1895. The Marshall Building was demolished for road widening in 1996. Kelvin House was designated a Registered Heritage Structure on September 15th, 2001 by the Heritage Foundation of Newfoundland and Labrador. Also view the Kelvin House and Conservatory Registered Heritage Structure, and the Kelvin House and Conservatory - City of St. John's Heritage Site on the Heritage Foundation of Newfoundland and Labrador web site. The Newfoundland and Labrador Heritage Web Site has on its site only a portion of the registered heritage structures in Newfoundland and Labrador. To view a complete list or search for a particular structure visit the Heritage Foundation's Property Search page.